There are several option buttons: NZ$5, $10, $25, $50, $100 or $150. You could always get yourself a couple of songs while you’re at it. Above, a PICTURE of the latest issue. This is NOT the link, it’s a picture of the PDF. The download link is below, called ‘Issue63’. Here it is folks, all the latest news and all the tips from the last month. I hope you enjoy it. Download it from the link indicated by holding down the Control key on your Mac’s keyboard, click the coloured link and choose ‘Save Link As’ from the pop-out menu. On iPad/iPhone, tap and hold on a link to open it in new tab or download it. B”eautiful, but rough around the edges” says Apple Insider. Review says Apple Watch is beautiful, but rough around the edges — After months of anticipation, the Apple Watch is here. 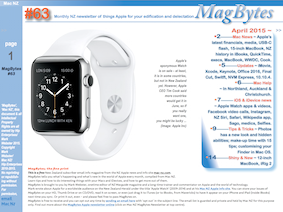 But as pre-release hype wanes and units trickle out to early adopters, it’s now a question of whether the Apple Watch delivers on its promise of being the company’s “most personal device ever.” In other Watch news, Mac Observer has four tips for prolonging battery life and those with tatted wrists report sensor problems. iOS 8 adoption cracks 80% mark in latest App Store data — Adoption of iOS 8 among iPhone, iPad, and iPod owners is up to 81% of active devices, Apple said on Wednesday in the latest update of its App Store distribution data, measuring traffic from April 27. Fashion industry gets its revenge as Donna Karan hires away Apple creative director — After years of poaching top fashion industry executives, Apple has found itself on the losing end as Donna Karan has reportedly hired Hector Muelas, who served as creative director of worldwide marketing communications at Apple, to fill a similar role at the fashion conglomerate. Microsoft hopes to court iOS apps to Windows 10 with Objective-C support — Microsoft on Wednesday announced plans to add Objective-C support to its forthcoming Windows 10 platform, a move that will make it easier than ever for iOS developers to port their applications over to the Windows platform. App Camp for Girls releases camper-driven app — App Camp for Girls (AGC) a great project that fosters an interest in coding and apps among young women and girls, has released its first app for iOS, the student-driven App Camp Quiz Compendium ($1.29). 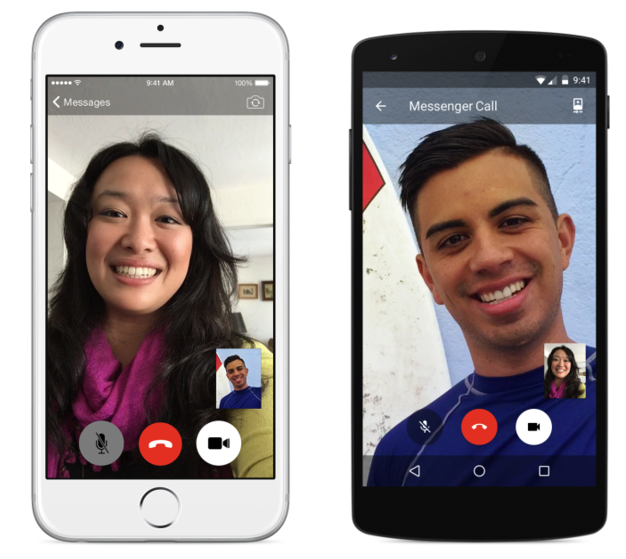 Facebook’s new video calling feature is available in the iOS and Android Messenger apps (image from Macworld). Apple Watch gets dunked and drilled, but comes out strong in durability tests — Yes, there are those willing to spend money on a top-flight gadget just to see how far you can push it before it breaks. Facebook adds free video calling to Messenger — Users can now place free video calls with Messenger, as Facebook continues to extend the app beyond simple text-based chats. With the feature, Facebook is also taking a jab at competing products like Apple’s FaceTime, Microsoft’s Skype and Google Hangouts. Facebook previously allowed video calling through its site on the desktop, but not within its Messenger app. 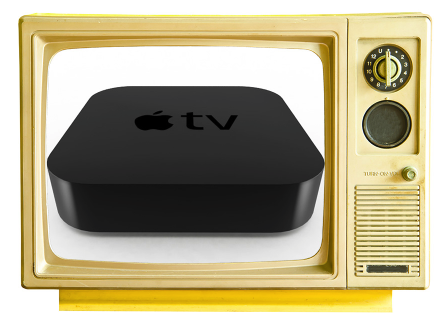 Apple plans to be part of ‘big media changes’, addicting to Cook (image from MacObserver). Estimates raised on Wall Street as Apple impresses investors again with another record quarter — The iPhone continues to drive growth at Apple, once again propelling the company to a record quarter that has left analysts on Wall Street confident the company’s stock will continue to go higher. Apple added $50B to its capital return program, and Apple promises to distribute $200B by 2017. I wrote about the quarterly results and Cook’s progress on iStart. ‘Big Media Changes’ — Apple CEO Tim Cook made it clear he wants his company to play a role in the rapidly changing market for entertainment content. He said as much during the company’s second quarter earnings conference call on Monday, and called out HBO Now as an example of giving customers what they want. Patriot unveils USB-C flash drive for Apple’s MacBook — New MacBook owners who need removable storage but don’t want to carry around a USB adapter now have a new native USB-C option in California-based Patriot Memory’s just-announced convertible flash drive. Apple wins patent on Kinect-like depth mapping technology for 3D gesture interfaces — Apple has been awarded a patent for a depth-mapping technology for a Kinect-like 3D gesture interface, adding to the intellectual property inherited from its acquisition of Israeli firm PrimeSense in 2013. 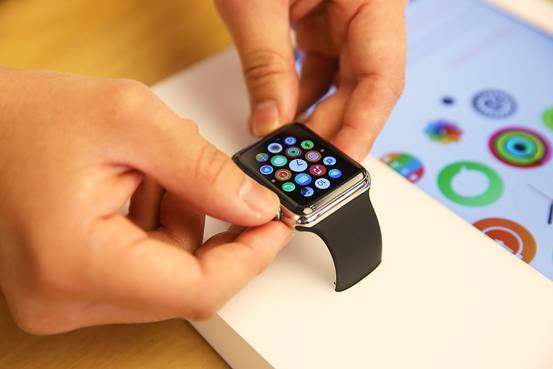 Apple Watch is in the hands of some customers; 3000 apps — Apple just launched the brand new Apple Watch App Store, accessible through the Apple Watch app included in iOS 8.2. 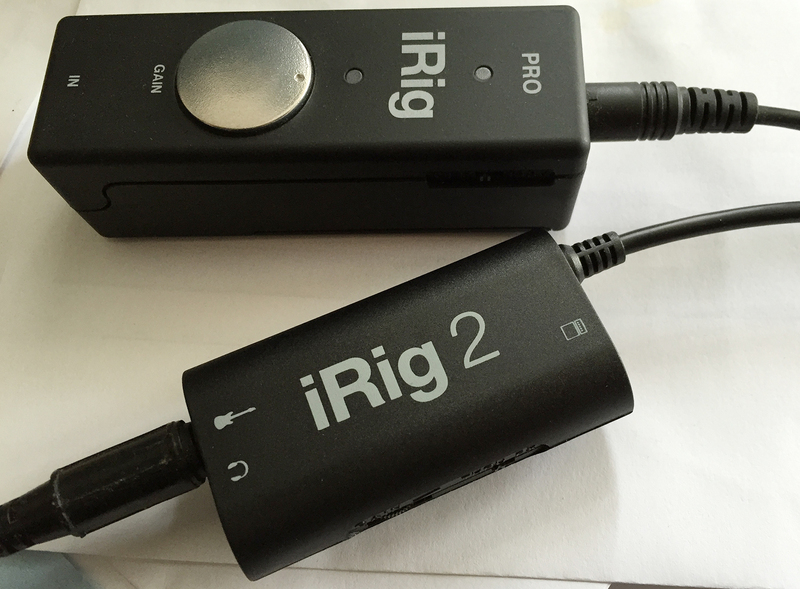 Macworld has an unboxing, pairing, and personalising ‘this strange new device‘. The Apple Watch chips have been laid bare in X-ray, microscope imagery, and reviewers have already tried to destroy Apple Watch in the shower and swimming pool, but failed. Instagram puts three filters and emoji hashtags at your disposal — Tired of your go-to Instagram filters? Meet Lark, Reyes, and Juno, Instagram’s newest additions to your creative toolbox. Cedars-Sinai Medical Center enables HealthKit integration for patient data — Los Angeles’ Cedars-Sinai Medical Center updated its electronic health records system over the weekend to support data from Apple’s HealthKit platform, the hospital’s chief information officer has revealed. Apple restarts iTunes Red Cross donations to benefit Nepal earthquake recovery — In the aftermath of a series of earthquakes which have left more than 3,000 dead in Nepal, Apple has again begun soliciting donations for the American Red Cross through the iTunes Store. By visiting a special iTunes page (which unfortunately is not available from New Zealand), customers can automatically donate to the Red Cross in denominations of US$5, $10, $25, $50, $100, or $200. Apple will pass 100 percent of the proceeds through. Apple updates iMovie for Mac with enhanced YouTube sharing, fix for random crashes — Apple on Thursday rolled out an update for its iMovie video editing app for OS X, fixing an issue that could cause the program to crash and baking in enhanced YouTube sharing compatibility. It’s available in the Mac App Store under Updates. 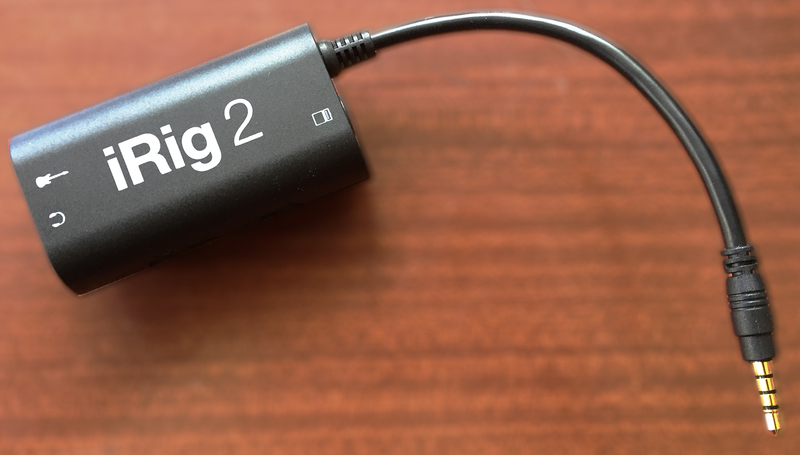 The first batch of USB-C adapters and cables, tested — When Apple announced the MacBook in March, the new USB Type C (USB-C for short) port caused head shaking and chin scratching. Here’s a rundown of what’s currently available and what it can do for you. But first, let’s define some basics. Manage your iTunes music library — This week, Kirk McElhearn looks at a few questions about managing iTunes music libraries, dealing with liner notes, album artwork in WAV files, and correcting capitalization in song titles. I also suggest a way to download music from the iTunes Store with an old Mac. Apple seeds OS X 10.10.4 beta 2 to developers, public beta testers — Apple has released the second beta version of OS X 10.10.4, the upcoming refresh of its flagship desktop operating system, to both registered developers and consumers enrolled in the company’s public beta program. Apple also posted Xcode 6.4 beta 2 on Monday. That update bears build number 6E14, and includes software development kits for iOS 8.4 beta 2 and OS X 10.10. ~ Was it a prop for aliens filming a space epic? Want to understand Spacetime? The latest episode of the PBS YouTube series Space Time is a great little eight-minute primer on spacetime. ~ That’s sorted that out then. Chinese geneticists modify human DNA — After weeks of speculation, it can finally be confirmed that geneticists in China have modified the DNA of human embryos. It’s a watershed moment in biotech history, but the experiment may ultimately serve as a major setback in the effort to responsibly develop beneficial interventions involving the human germline. ~ But I don’t think I’ll be shedding any water over it. 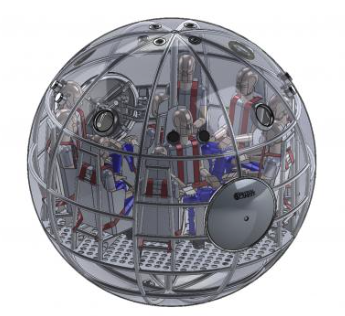 Giant survival ball for Antarctic adventure — Aeronautical engineer Julian Sharpe, founder of Survival Capsule, got the idea for his capsules after the 2004 Indonesian tsunami. The product is strong enough to survive a storm at sea or getting crushed between two icebergs. ~ As long as there’s plug for the heater and he can watch YouTube he should be OK.
Buckminster Fuller car reconstructed — He was either a brilliant inventor or a nutcase charlatan, depending on who you ask. 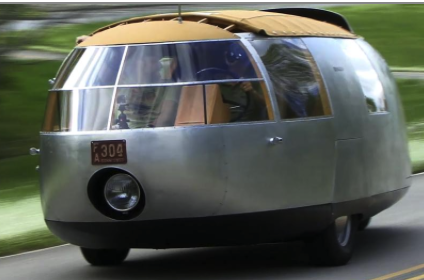 And perhaps no single invention of Bucky’s encapsulates that divide quite like his Dymaxion car. Was it a death trap or a feat of engineering genius? The Wall Street Journal recently tested out a functioning replica. ~ And they decided it was very much the former. Ancient hangover cure — While sifting through ancient texts, researchers have found a reference to a “drunken headache cure” that was used 1900 years ago. The suggested cure was found amongst 500,000 texts originally found during archaeological investigations of Oxyrhynchus, in Egypt, back in 1915. The scraps of papyrus now sit in the University of Oxford’s Sackler Library. ~ The sufferer should string together the leaves of a shrub called Alexandrian chamaedaphn. We all have that, right? I think I’ll stick with eating eggs. Liquid mercury under Mexican pyramid — An archaeologist has discovered liquid mercury at the end of a tunnel beneath a Mexican pyramid, a finding that could suggest the existence of a king’s tomb or a ritual chamber far below one of the most ancient cities of the Americas. ~ Or maybe it leads to an ancient dentist or hat maker. 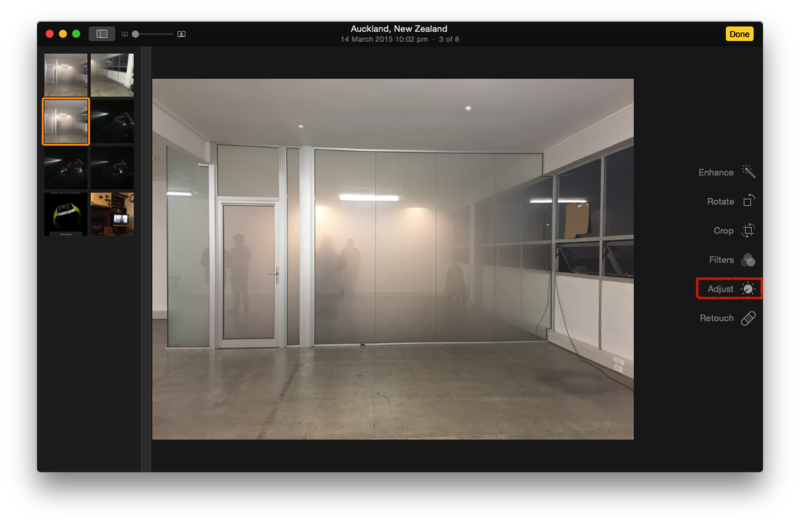 1/ Photo adjustments on Mac — This new program Photos might take a bit of getting used to. With Photos, we’ve got a lot of the same control of image editing we had in iPhoto, but it’s a bit more difficult to get to. As with iPhoto, you’ll double-click an image first, and then select the Edit button in the upper-right (or press Return). The tools that appear should be pretty familiar. Most work the same way that they did under iPhoto, though the filters are now the ones included in recent versions of iOS. 2/ Finer edits with ‘Adjust’ — When you choose Adjust though, there is little slider under each one. To access the more advanced adjustments, you’ll hover over any of the categories, and when the drop-down arrow appears in the upper-right, click it to reveal more controls. 3/ Add more Adjustments — There are additional adjustments you can add with the Add button: if you often need Noise Reduction or White Balance, just add in those controls, then click Add again and choose Save as Default. 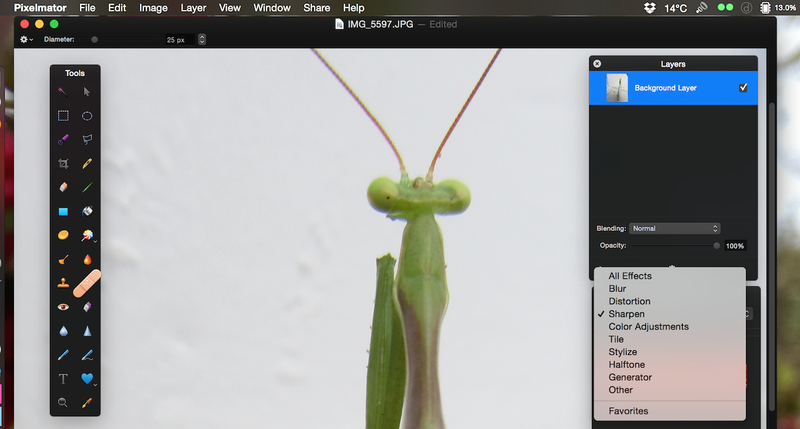 Afterward, you’ll have your choices within the adjustments panel for every picture you edit. 4/ Advanced adjustments — Note that at the bottom of the list of adjustments you can add, there’s an Advanced section. Here are the precious Levels and White Balance controls. 5/ Undelete photos — With Photos on the Mac, the Recently Deleted album doesn’t seem to show up unless you know the trick to accessing it, that is. It’s hidden under File> Show Recently Deleted. Choose that, and you can either restore images you’ve removed or delete them permanently by selecting items and clicking the buttons in the upper right. Photos stay in this file for 30 days after you press that Delete key. Two new New Zealand multi-touch books available in Apple’s iBooks explore the power of the platform — Please excuse me for blowing my own trumpet to some extent, but this is the culmination of seven years research and writing work for me, and, for both Steve Bolton and Paul Luker, a year of intensive work on Jack’s War (NZ$8.99). 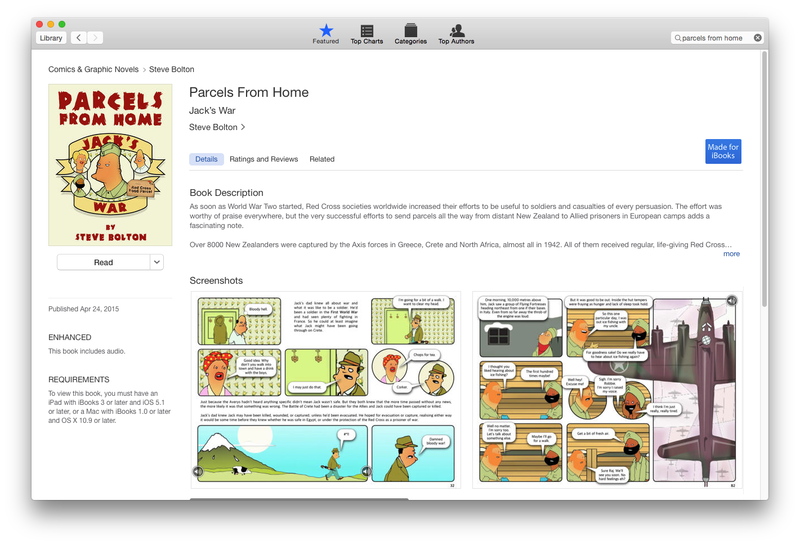 We have released the first two Parcels From Home books into the iBooks Store. Both books talk about the New Zealand Red Cross POW parcel scheme in World War Two, and these releases coincide with Anzac Day and, on May 8th, the 70th anniversary of the end of World War Two in Europe. The books take different approaches: Parcels From Home: The POW Parcels Scheme and the New Zealand Red Cross in World War Two is a history book covering the worldwide parcel scheme and, much more specifically, the stellar New Zealand role in the scheme in relation to our c9000 prisoners of Germany, while Parcels From Home: Jack’s War is a work of ‘creative non-fiction’ in graphic novel form. It’s fully illustrated – beautifully illustrated – by New Zealand author and artist Steve Bolton. Special features — Both books support Apple’s cool iBooks multi-touch features. Although they only work on iPad and Mac (there’s too much going on to fit them onto iPhone screens) they support Apple’s note-taking and highlighting features. Buy one book once and install it on both your Mac and iPad. Stop reading on a page on your Mac and open it on your iPad, and it opens to the page you finished on. Any notes or highlighting you added on one device appears in the book on the next – all thanks to Apple’s brilliant implementation of iCloud, of course. Both books support thumbnail Contents view (buttons appear at top left) for fast navigation, and search. As study aids these features put them into a league well above traditional books, much as we love traditional books. But we went further, thanks to Paul Luker’s design acumen. In Parcels From Home (NZ$12.99), images ‘pop’ and expand when you tap or click them. Some of these images have never been published before, by the way. You can zoom in – two fingers placed on an iPad screen or Mac trackpad and spread apart – lets you zoom in and inspect them even more closely. We have some primary source interviews with New Zealand WII veterans and, in some cases, you can hear them. Bold text means a glossary reference. Tap/click it and you can see where the information came from. The glossary is in both books as a study aid. 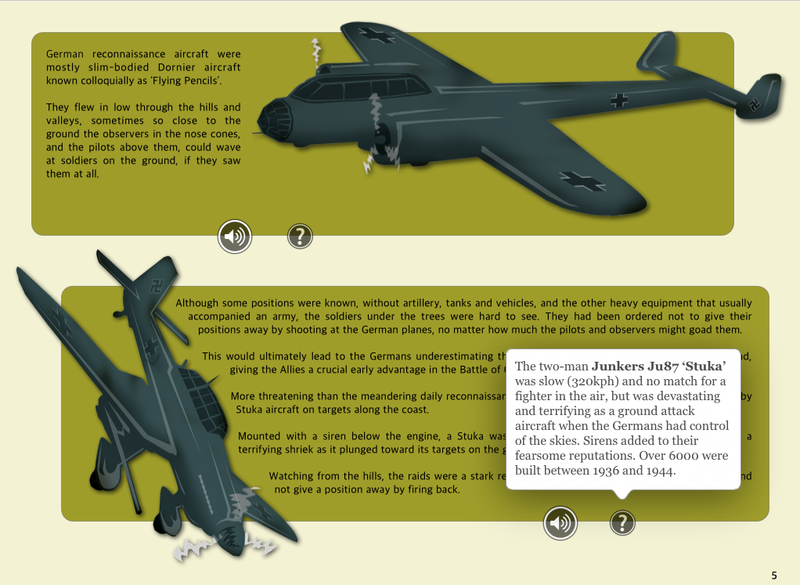 In Jack’s War, we have added an extensive glossary too, but also sound files with the authentic sounds of, for example, some military equipment: hear a real Bren Gun, or German Stuka, as well as some environmental effects. There are also informational pop-ups. Foreign words show translations when you tap or click them. Big plans —We have a third Parcels From Home book in the pipeline. This will be released in November 2015 to help commemorate the 100th anniversary of NZ Red Cross. This is an expanded history book with more images, more information, more sound files and a whole additional chapter on the War in the Pacific. It will cost NZ$18.99. But before that we have Lynda Nunweek’s brilliant book about friends growing up in New Zealand in World War One, the start of an engaging series. We are translating When The World Returns about Dutch WWII resistance figure Wim Naeijé – this has never been published in English and the author is adding in extra content for CreativeTech. We have a range of extremely interesting books coming out, including never-before-published NZ band photos by outstanding photographer Frances Carter, currently working in New York … and much more. Stay tuned — Search on ‘CreativeTech’ or ‘Parcels From Home’ in iBooks to find our volumes. If you consider buying them, I’d appreciate it – all the work I detailed above has, so far, been done for love. We don’t receive a cent until we sell some books. We made these because we thought the stories needed to be told. Thank you, most sincerely, in advance! Launches — We have two. The first is in Wellington at the NZ Red Cross HQ presented by NZ Red Cross director Doctor Jenny McMahon and MP for Wellington Central Grant Robertson on April 24th, and another in Auckland upstairs at the Grey Lynn Returned Services Club on May 1st. We will display interesting items and show how the books work at these events – and we can for your interest group as well, on request. For review copies, more information, to schedule a free talk or presentation, please email Mark Webster at markwebster at vodafone.co.nz. 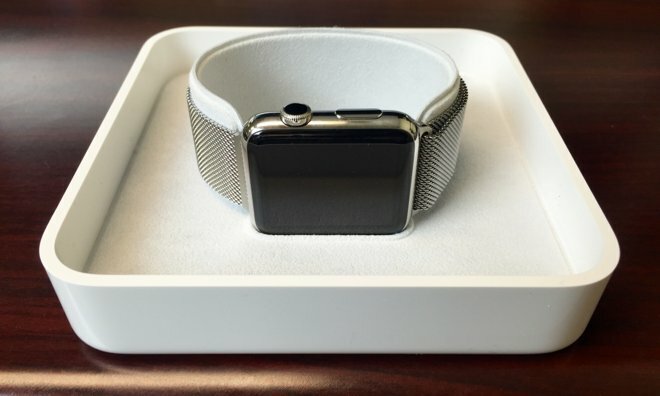 Buyers are about to get their first Apple Watches (image from Apple Inc). Apple starts shipping first wave of Apple Watches — Apple Watch is coming in many countries (now New Zealand), and for many, it will arrive as soon as Friday. Lucky Apple Watch buyers who saw an April 24-May 8 estimated shipping date on their pre-orders earlier this month have received notice that April 24 is the big day. Apple posts final Watch video — Apple added the final three videos to its Apple Watch guided tour series on Thursday. The short videos show how to use Apple Pay as well as the fitness-related Activity and Workout apps. Apple Watch runs ‘most’ of iOS 8.2, may use A5-equivalent processor — The Apple Watch is using ‘most’ of iOS 8.2, with a new subsystem called Carousel in place of the Springboard homescreen found on iPhones and iPads, developer Steve Troughton-Smith said on Thursday, also suggesting the Watch’s S1 processor appears to be equivalent to the Apple A5. Apple beefing up Siri, speech and language teams with wave of new openings — Apple on Wednesday and Thursday opened up several job listings related to speech technology, Siri, and language recognition, suggesting intensified work on natural input for future products, AppleInsider has discovered. Behind Alto’s Adventure — Here’s the interesting story behind the development of Alto’s Adventure, (AWT’s review + gameplay video here) the delightful snowboarding game that has been featured by Apple several times. The story starts when co-creators Ryan Cash and Jordan Rosenberg were just kids playing in the snow, and ends some amazing fan art and other accolades recognising their wonderful game. Apple under fire once again for inconsistent App Store rule enforcement — Apple’s App Store review policies have found yet another unwanted spotlight after the company allegedly rejected an iOS app update because its developer mentioned Pebble’s competing smartwatch in the app’s metadata.